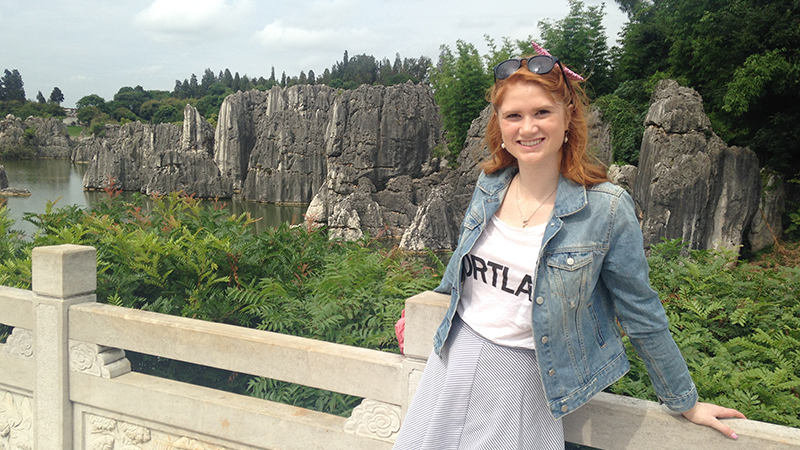 Clark Honors College senior Rachel Grant, a double major in Japanese and economics with a minor in Asian studies, has been selected to take part in The Oregon-Oxford International Human Rights Project as the UO’s first-ever Frohnmayer Fellow. This is the fourth year the UO will be sending students to Oxford during spring break to dig deeply into global justice and human rights alongside some of the top experts in the field. A total of 10 students are making the trip. This year’s introduction of the Frohnmayer Fellowship, sponsored by the Office of the President, is in honor of the late President Emeritus Dave Frohnmayer, who studied at Oxford as a Rhodes Scholar in 1964 and received his master’s degree there in 1971. Frohnmayer went on to become a state legislator and attorney general before returning to the UO, first as dean of the law school and then as the school’s 15th president, a post he held from 1994 to 2009. He died last year at age 74. The Oxford program is designed to equip students to become international policy leaders, emphasizing many of the areas that Frohnmayer continued to contemplate through his Advanced Topics in Leadership colloquium, which he taught as professor emeritus in the honors college from 2011 to 2014. Grant’s interest in human rights began as a freshman, when she joined the Carnegie Global Oregon Freshman Interest Group. Through the group, she became interested in the U.S. penitentiary system and subsequently joined the Inside-Out prison exchange class Geography of Inequalities taught by geography professor Shaul Cohen. That class “opened my eyes to the disparities occurring worldwide in terms of wealth, race, gender, privilege and more” Grant said. She followed that experience with the course Human Rights in the 21st Century, taught by Ryan, and went on to be named a Carnegie Ethics Fellow for the Future last fall while presenting at a conference in New York.